The man himself may no longer be with us, but Caroll Shelby’s legacy of working with Ford to create some serious performance machines lives on with the latest entry into the portfolio, the all-new Ford Mustang Shelby GT-350. Unlike the previous generation’s Shelby Mustang, the GT-500, the GT-350’s primary objective isn’t massive horsepower numbers and straight line acceleration. Instead, the GT-350 is designed from the ground up to be a road course terror, and this little pony has the goods to carve through corners with the best of them. The existence of the GT-350 has been a poorly-kept secret for months now, with spy photographers spotting the car testing at the famed Nurburgring on multiple occasions, but now we’ve got official word from Ford on the new car’s imminent arrival, and well as a handful of details on what to expect from the newest top-spec factory Mustang. On the powertrain front, the GT-350 gets an all-new and very trick naturally-aspirated 5.2-liter flat-plane crank V8 – a production first from Ford, and the kind of tech you’d find under the hood of a Ferrari 458 Italia. Perhaps taking a page from the Hellcat playbook, Ford is not specifying exact output at this time, only stating that the engine will produce “more than 500 horsepower” and "a torque peak above 400" pound-feet. A six-speed manual gearbox and a Torsen limited-slip differential will be standard. Curiously, while Ford proclaims the new GT-350 as “an all-day track car that's also street legal”, an engine oil cooler, differential cooler and transmission cooler are included only if you opt for the Track Pack options package on top of the standard-spec GT-350. Boasting the stiffest chassis in the company’s history, the GT-350 will feature a wider front track, along with recalibrated spring rates and bushings all around, as well as a substantially lower ride height than the Mustang GT. The GT-350 will also receive adaptive MagneRide dampers, a first for Ford and much like what you’d find on a C7 Corvette. These dampers allow the driver to adjust suspension stiffness when required and also provide their own intelligent real-time damping adjustments, and their performance in other vehicles bodes very well for what one might expect from the GT-350. To make sure the pony can stop as well as it can go, the GT-350 will receive the most track-capable braking system ever offered from Ford. The system is comprised of 15.5-inch rotors up front, clamped by Brembo six-piston fixed calipers with integrated caliper bridges, while 14.9-inch rotors with four-piston calipers can be found in the rear. Inside, an all-new drive-mode system allows selection of five unique settings that change the characteristics of the ABS, stability control, traction control, steering effort, throttle mapping, MagneRide tuning and exhaust settings, although it is unclear at this time if you’ll be able to mix-and-match to create custom presets. Recaro sport seats, a flat-bottomed steering wheel, a new set of gauges and a de-blinging of the shiny surfaces inside to reduce reflections are all part of an effort to make the GT-350 as much of a driver’s car as possible. Externally, the GT-350’s form has truly followed function, with extensive aerodynamic optimization of the car in order to increase downforce and maximize cooling. All-new bodywork from the windshield forward includes re-sculpted fenders, hood, and front fascia to help reduce the car’s aerodynamic signature and a new front splitter and ducted belly pan help to press the GT-350 to the pavement at speed. 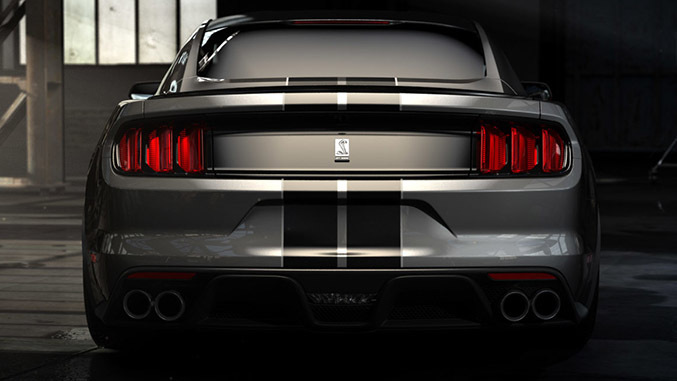 We will undoubtedly have more updates regarding the Shelby GT-350 in the near future as Ford dishes out the specifics. In the meantime, check out the press release from Ford below (which includes a brief explanation of why a flat-plane crank is a good thing to have in a performance car) for additional details, and be sure to keep an eye on the 2015 Ford Mustang GT-350 overview page for updates as we have them.